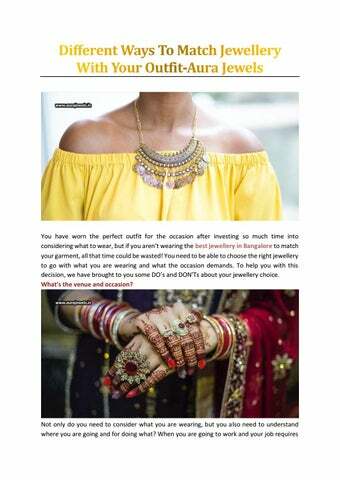 You have worn the perfect outfit for the occasion after investing so much time into considering what to wear, but if you aren’t wearing the best jewellery in Bangalore to match your garment, all that time could be wasted! You need to be able to choose the right jewellery to go with what you are wearing and what the occasion demands. To help you with this decision, we have brought to you some DO’s and DON’Ts about your jewellery choice. What’s the venue and occasion? It isn’t always necessary that you wear jewellery that matches the colour of your outfit. You could also opt for contrasting colours to make a statement. For this, you can mix warm jewellery with cool coloured garments, and cool jewellery with warm coloured garments. For example, when you wear a plain royal blue or purple outfit, a set of fiery red rubies will work great; and when you wear a striking yellow or orange dress, dark blue and deep green gemstones will be the best choice. Not such a great outfit? If you donâ&#x20AC;&#x2122;t have the greatest outfit, and then you want to focus the attention to not what you are wearing, but your face that glows bright, then statement earrings are what you have got to wear. Wear flashy glittery earrings for a rich occasion to highlight your eyes that are perfectly done with flawless make-up. Also, the shape of the face matters a lot with the earrings you should wear. For example, a heart-shaped face demands straight drop earrings, while an oval face demands studs. How to complement your skin tone? gold studded with red, purple, or blue gemstones, is a great choice for cooler skin tones; while yellow gold studded with orange or green gemstones, is for warmer skin tones. When nothing works, diamond does! Diamond is a girl’s best friend, and it’s true because a real diamond goes with just about anything! So, when you can’t decide upon what to wear to match with the outfit, venue, and occasion, you can always depend upon diamonds. You can alter the shape and size of the diamond depending upon the occasion and venue, but diamonds will always work well. For instance, when it is a simple occasion like your job or a religious ceremony, you can wear diamond studs; and when it is a wedding or an evening club party, you can flaunt the big sized diamond rings, diamond danglers, diamond bracelet, and diamond neckpiece. With these simple tips and guidelines, you are now ready to coordinate your jewellery like an expert accessorizer! And, when you want to shop for some new gold, silver, and diamond jewellery, you can always have an expert manufacturer at hand. 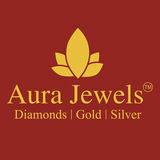 Here, we speak about Aura Jewels, the best jewellery shop in Rajajinagar in Bangalore, where you can choose from readily available designs, or have the best jewellery pieces customized especially for you.